You wouldn’t think that simply spending a day gazing at some of Disney’s best visual and performance art would be cause to overload on food, but after a few circuits of Epcot’s World Showcase during the International Festival of the Arts you’ll find you’ve built up quite a hunger. 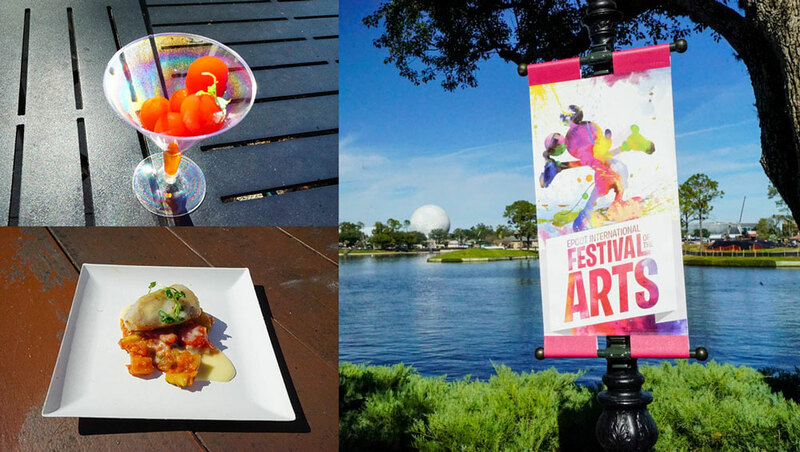 Naturally, Epcot has once again packed the festival grounds with Food Studios and other limited-time offerings to give guests the sustenance they need to survive in the competitive world of amateur art collection. While our minds were filling up on some inspirational eye-candy, our bellies were filling up on actual food, all so we’d be able to share an accurate account of this year’s culinary canvases. 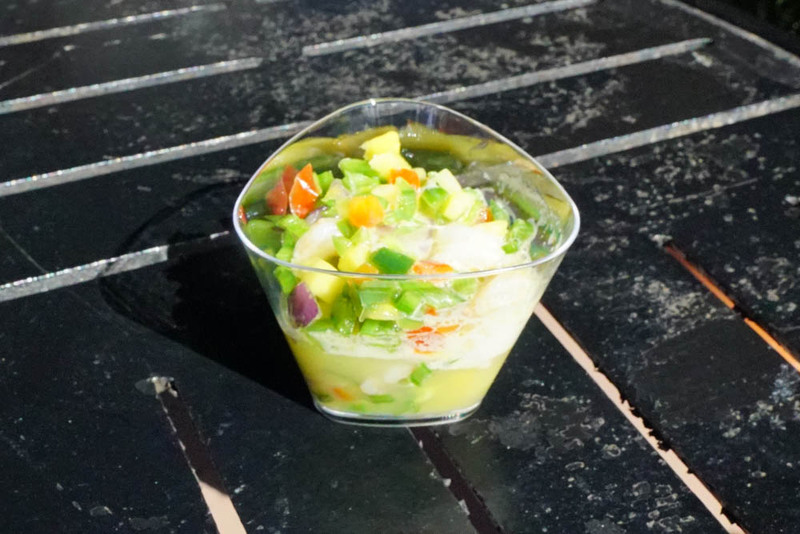 We’ll be adding to this article as we add to our waistlines, so check in for new food items throughout the festival, which runs until February 25th this year. For the full roster of festival menu items and prices, head HERE. Some would say that the best art starts subtly. They would love this dish, as the flavor is anything but intense. The chicken was a decent quality — which is good, because that’s all we tasted. It could certainly use some improvement. A nice light snack, and not breaking the bank at six dollars. 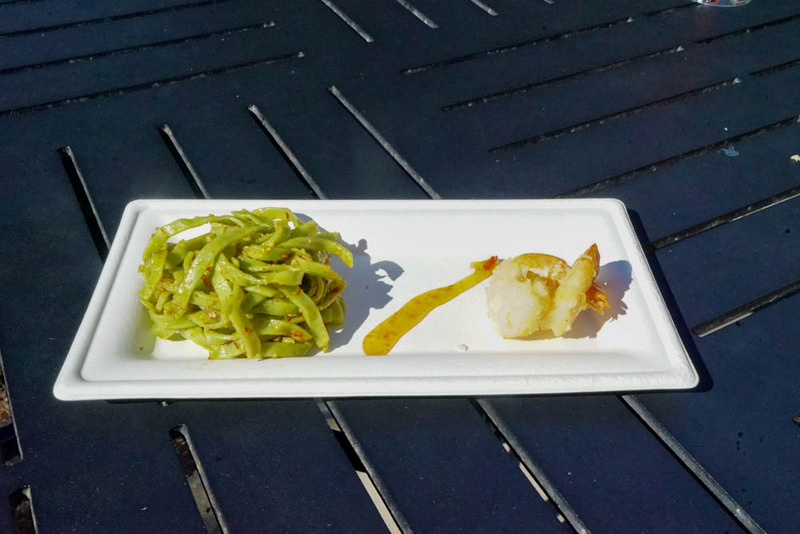 While not surprising in flavor, the combination of shrimp and its accompaniments provided one of the most warm-weather-friendly offerings we tasted. It might be difficult to tell from the image, but this shimmering delight is no false advertisement. When in direct sunlight it becomes quite easy to see that yes, it is indeed filled with glitter. It doesn’t just get by on the gimmick though, as those who tried it were impressed with its refreshing flavor. We did not find this one to be worth the price tag. This two shrimp were acceptable yet not impressive, and although the spinach noodles provided a slight spicy aftertaste it felt like the flavor party went mostly unattended. This dish is just a slightly different take on China’s various festival shrimp-and-noodle offerings. This offering was a fun textural experience, with skinned tomatoes popping open to fill our mouths with plum juice during eat bite. Because of its unique nature, it’s probably not for everyone. 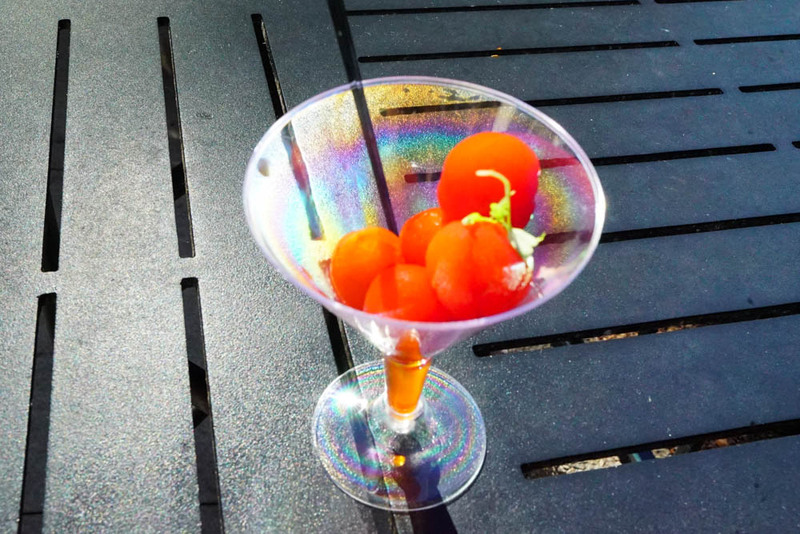 Even if you’re a tomato fan, you’d better really like plum juice to enjoy it. It is another on the list of perfect bites for a hot day, as it was relatively cool and refreshing. 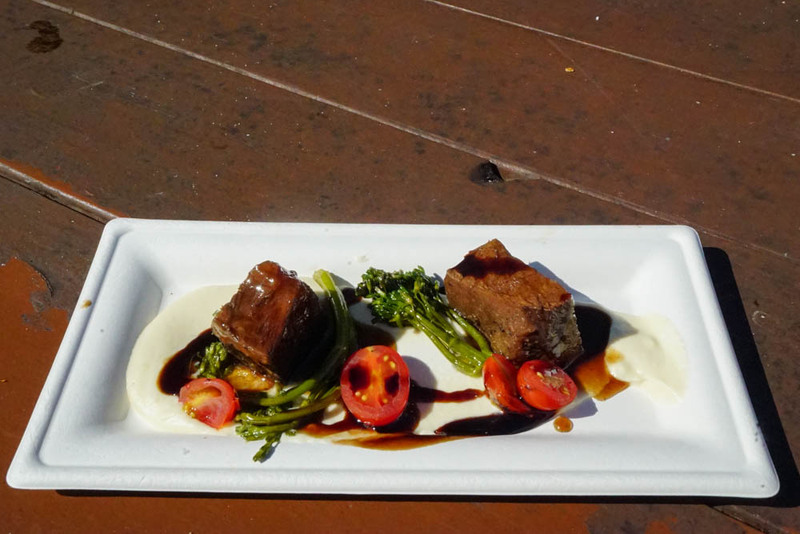 One of the best offerings we had on opening day, this short rib dish was equal parts flavorful and tender. At only $8 for this level of quality, it is certainly worth a taste. A wonderful fish offering that wasn’t too fishy, by the end of opening day this dish had been brought up again and again. 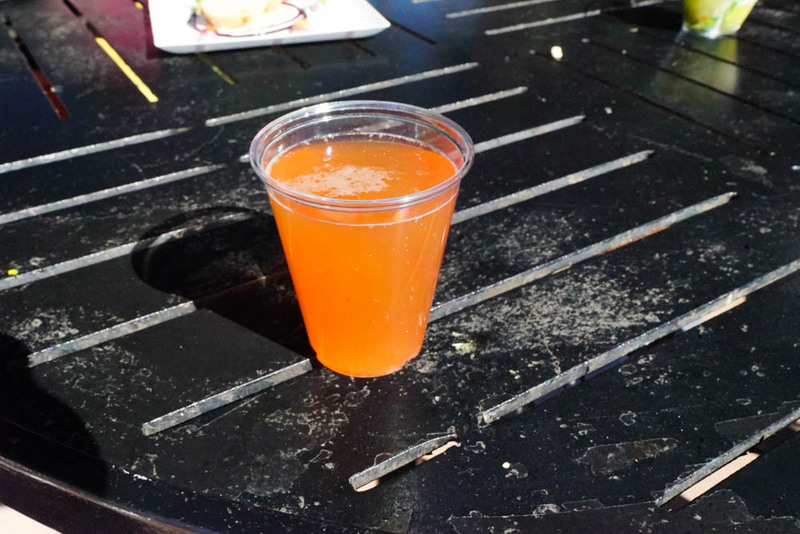 You’d be hard pressed to find another $7.50-sample that was its equal in flavor or consistency. 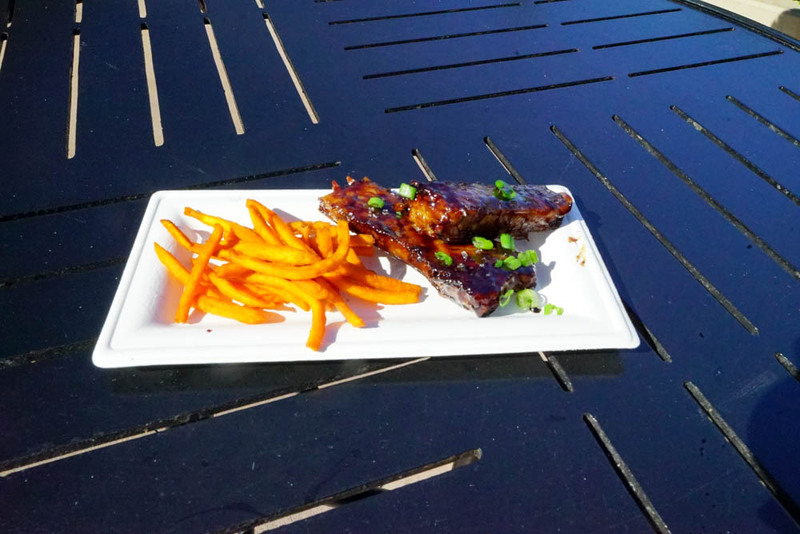 These sweet and sour balsamic-glazed pork ribs ended up being a bad call on our part. For one, any messy item which requires you to use your hands rather than a fork means you’ll need to hit up a sink and wash them shortly thereafter. The ribs were exceedingly sweet, and the balsamic taste would be overpowering for those that aren’t die-hard fans of the flavor. The sweet potato fries were pretty standard. 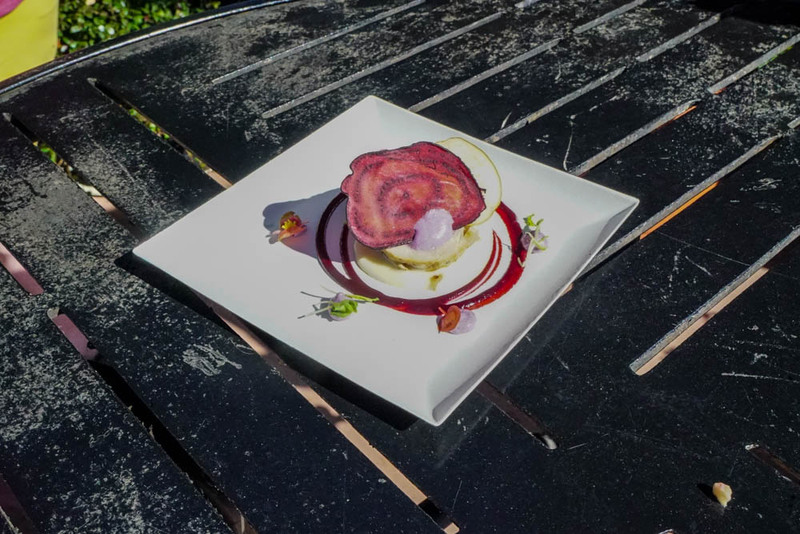 Translated, this is a “Roasted Candied Beet Salad with Goat Cheese Fritters.” The beats were cool and just sweet enough to be flavorful, but not so much that they ruined the deep earthiness of the vegetable. It would be nice to say that this was balanced out by the warm cheese balls, but the heat of the goat cheese inside was intense. As it turns out, if you heat up goat cheese and let it sit inside a protective shell of breading it retains a rather volcanic temperature. The flavor was still enjoyable, so best to cut those fritters in two and let them sit for a moment. This was one of the most filling meals we could find for $8, and it was not short on taste. 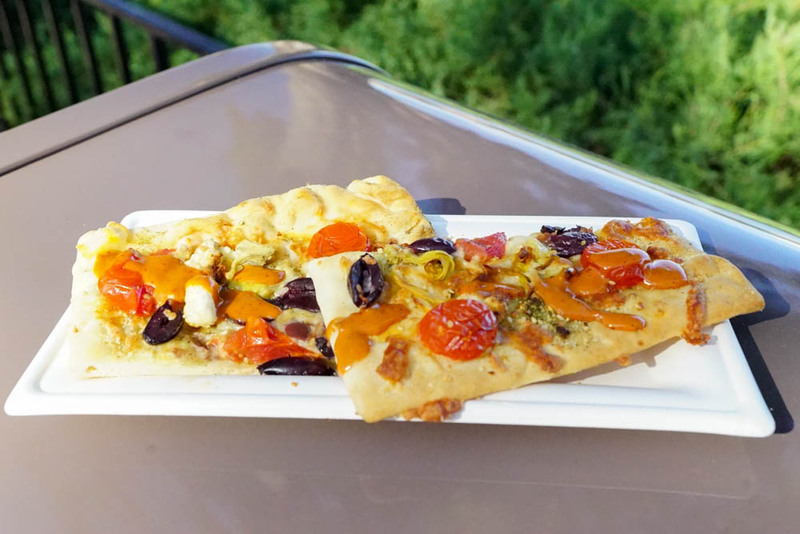 The spices, olives, artichoke, and cheeses were delicious and covered a decent portion of its canvas, and the flatbread itself didn’t suffer the “cardboardiness” that you might expect to find in theme park flatbread. 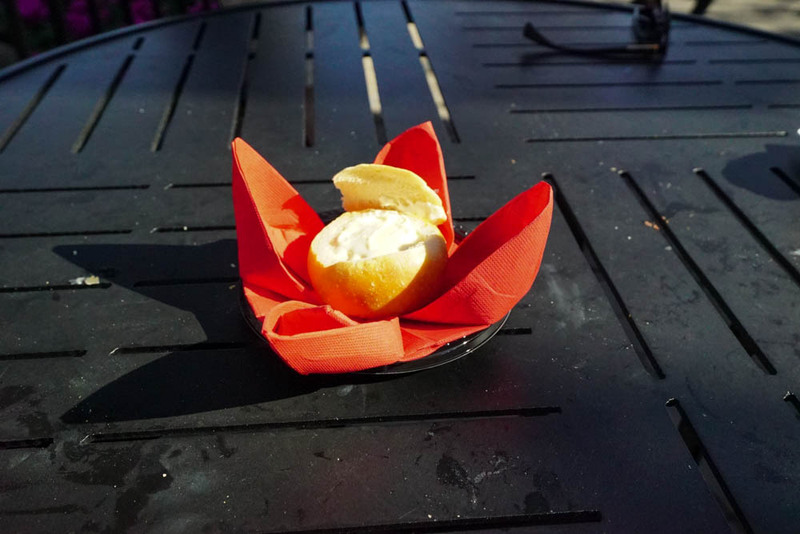 This bread bowl filled with brie was not only tastey but extraordinarily filling for under $8. 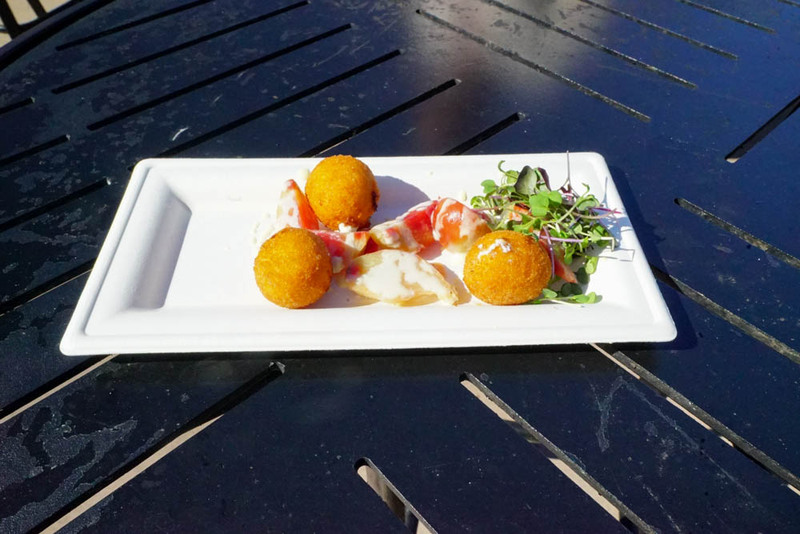 The primary downside to this dish is that on hotter Florida days, eating what is essentially a cheese grenade may momentarily hamper your enthusiasm for the amount of walking that a full park day requires. This Salmon Terrine was one of the most aesthetically pleasing offerings we found along the World Showcase. The flavor was rich and complex, but the consistency might be off-putting for some. 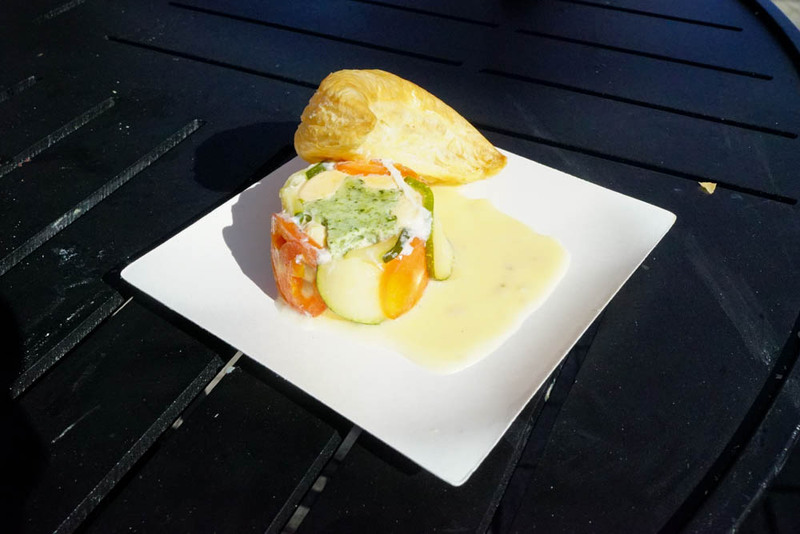 While the dry, crumb-showering puff pastry might not be that odd, the salmon is pureed and served in one solid form akin to what some folks only encounter is Spam. Some will love this “Spalmon,” while others will find it a little unsettling. While I don’t think most of us are accustomed to a poached egg on our BLT, it serves as a wonderful addition to the pork belly and tomato jam. The end result was a dish that felt appropriate for breakfast, lunch, or dinner. Other than the rye curl which, although pretty, didn’t seem efficient to the actual consumption of this meal. 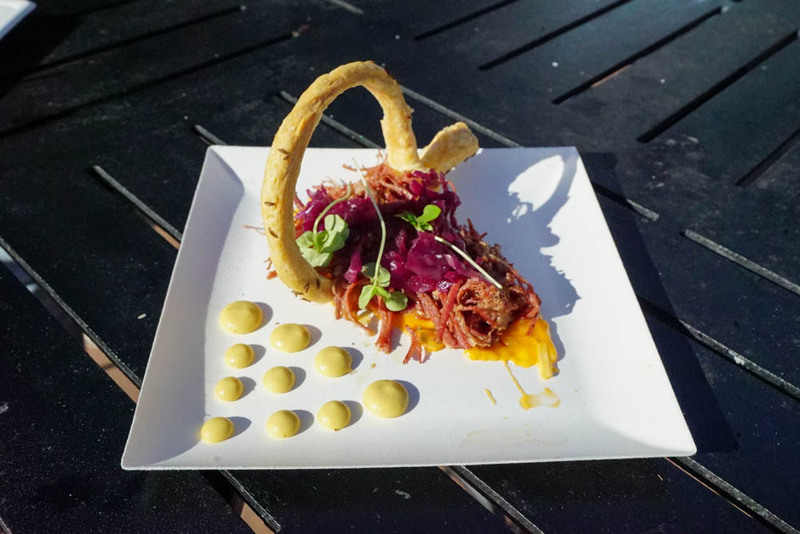 The corned beef, pickled cabbage, and dressing were all extraordinary, and this dish was a favorite among all who tried it. 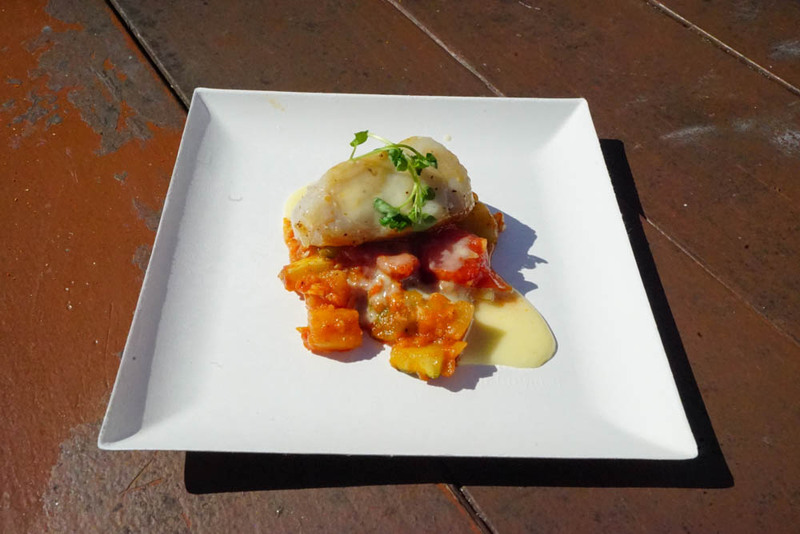 Our last dish on the festival’s debut day was this delightful dessert. The strawberries were cool and fresh, but it was the dollop of cheesecake filling in the middle that really pleased the palate. It was very much worth the $6.25 price tag.